Also we would love to see Mother's Day In the challenge. So get creative and take part this week! Here i have made a Handbag Charm for my mother , using A Magnolia stamp , which was stamped onto White Shrink plastic, and then colored in using Gel Pens. I also then looked around & Found a very good tatty children's bag, but it had some lovely lilac metal chain for the strap, So i pulled that off and cut it down to size i wanted. Also added some mother of pearl beads and many more & A crystal i got from a RAK from Rosie @ Christmas in my Altered Tin. Just hope she will like it now. This entry was posted on 10.2.08 and is filed under Magnolia Stamps . You can follow any responses to this entry through the RSS 2.0 feed. You can leave a response, or trackback from your own site. I'm sure she will love it. It's a brilliant idea and will brighten up any bag. 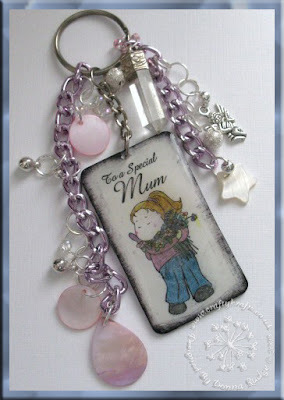 such a pretty charm and a fabulous idea for the Magnolia stamps too! thats really clever donna. i love this project. Of course she'll like it ~ it's gorgeous! oo alex you have given me an idea with your comment.. off to do some planning lol. This is gorgeous Donna, I am sure your Mum will love it, I have to try this shrink plastic with Magnolia, it looks fabulous! love the idea of making a key ring too! Oooo what a great idea I think this is gorgeous. This is a brilliant idea... really clever. Would love one of these myself... she will love it!